Residential window film is a great option to have in your home, especially in South Florida where we live in the constant sunshine. It can be used as a means to limit the amount of sunlight that comes into your home and it can also include a decorative element, with many different styles to choose from. If you are interested in the different residential window film products, there are many options to choose from. Unfortunately, after sometime, your window film can start looking tatty if it is left un-maintained. A dog’s wet nose against the window film, paw prints, sticky finger marks and smudges all contribute to dirty windows. It is important to keep your residential window film maintained and cleaned correctly in order to prolong its longevity. It is important to not use any scratchy, rough or harsh cleaning materials such as scourers or bristle brushes as this can scratch the window film and leave permanent marks. After one week of curing, you will be able to wash your windows as usual. Doctor Window Tint suggest using a vinegar-based glass cleaner. If this is not available at the time you are cleaning, water and mild soap will do. It is strongly advised not to use any products that contain ammonia; as over time, the ammonia will eat away at the residential window film. Your window film should last between 10 and 15 years if it is well maintained, so you want to make sure you use the correct cleaning materials. Use distilled water. It is worth the extra cost than using municipal water, also known as ‘hard water’. Hard water contains traces of lime, iron and minerals which can end up leaving a layer on your window film which over time will scratch it. After you start spraying your windows with the solution, make use of a 100% cotton cloth to wipe the dirty areas. Take care not to apply too much pressure. As a method of drying, you can use a rubber squeegee to get rid of the water that still remains. When using the squeegee, wipe in a diagonal and vertical direction so as to avoid streaks. Use the cloth to wipe up the water and soap that has puddled on the floor. Once the cleaning process is complete, spray plain distilled water onto the residential window film and squeegee using the same vertical and diagonal movements to remove any remnants of soap that may still be around. Make not sure to allow water to puddle for too long at the bottom of the window. Dab excess water with your cotton cloth. Rather clean in the morning or evening when there is less sunlight, as the film tends to soften when it’s warm and become more likely to scratch. Lastly, make sure you use a different cloth for cleaning the outside and inside of your window to avoid scratching the residential window film. 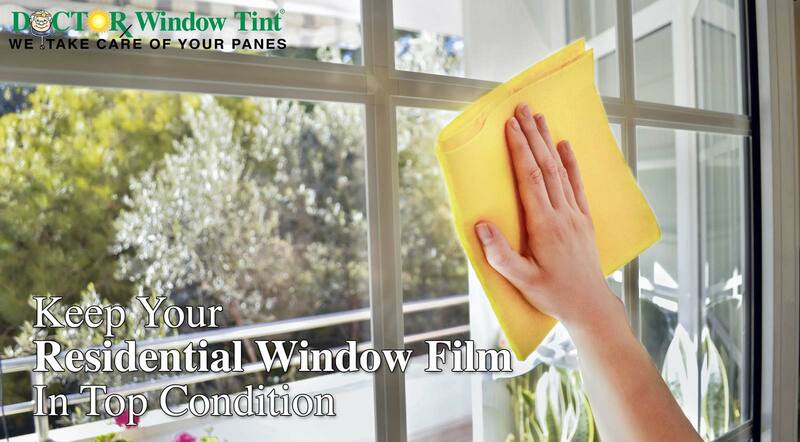 Remember to do your utmost to keep your residential window film in good condition. As you can see, window films are a long-term investment and so giving them the proper care if very necessary. If you are looking to install window film in the home make sure you use a professional company like Doctor Window Tint – call us today (305) 827-8468 for a free estimate.